Feather Your Nest: Radiant Orchid Named Color of the Year! Feather Your Nest from Urban Cottage is devoted to finding unique and affordable home accessories to make your house a home. Radiant Orchid Named Color of the Year! This year, Pantone took a bit of shift in the color department. After two years of very bright, bold colors of Emerald Green and Tangerine Tango, it named Radiant Orchid the color of 2014. 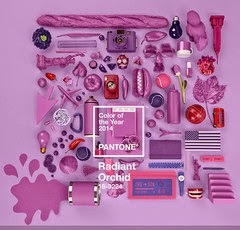 Radiant Orchid is described by Pantone as a color that "blooms with confidence and magical warmth that intrigues the eye and sparks the imagination. It is an expressive, creative and embracing purple—one that draws you in with its beguiling charm. A captivating harmony of fuchsia, purple and pink undertones, Radiant Orchid emanates great joy, love and health." This color is more subdued, but bring a peaceful and happy note to any home. Use it for an accent wall or a dash of color in accessories. No matter what way, enjoy it.